Fall is my favorite season! So, I look forward to Autumn’s beauty and earthy decorations and by now I’m happy to leave Summer behind! Today I am sharing eight things to do right now… even if you love love love summer and are still swimming in the pool or eating summer picnic food or picking summer’s bounty out of your garden or going on vacation or doing fun summer activities. Eight things that will inspire you and help you get ready for the upcoming Autumn season. So keep your toes in the sand and your heart loving summer but make a little room in your head for planning for Fall! For me, each new season start by making a wreath! NOW is the best time to make an early fall wreath. Wouldn’t you love to have a great new fall wreath for your front door? You don’t have to hang it now, but it will be ready when you are! Fall is such a busy time, so making a fall wreath now is one thing you can do and then check off your list. 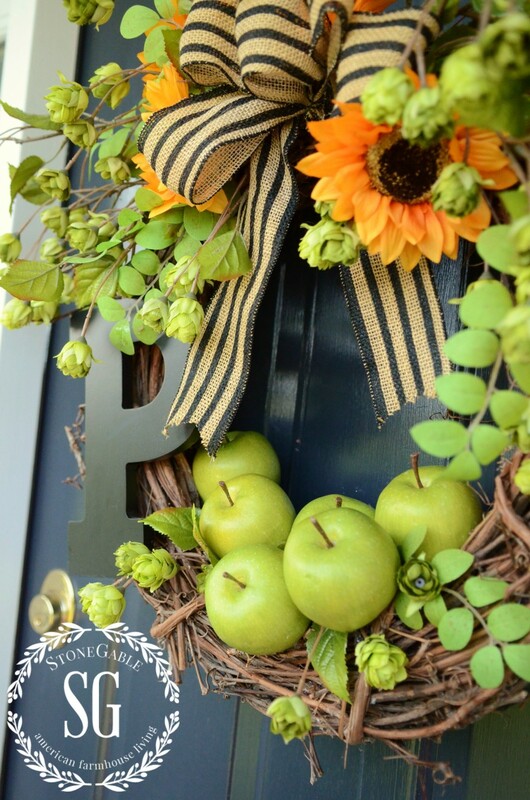 My EARLY FALL GREEN APPLE WREATH is perfect for this time of year and will work until the leaves fall! 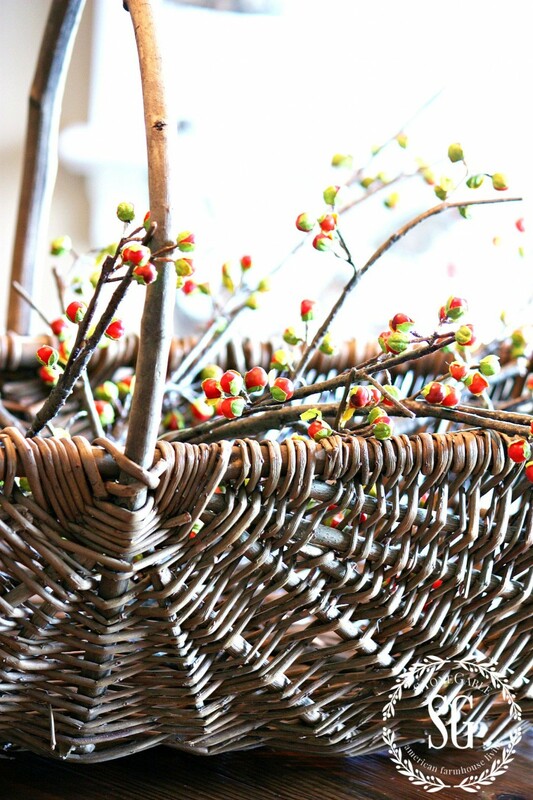 Why not style a beautiful vignette for a coffee table or kitchen table? 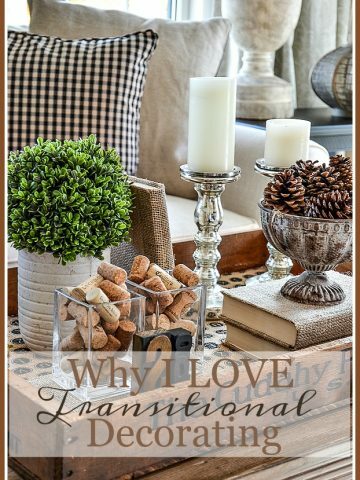 You can create a “transitional vignette” that will work now and with just a couple of small tweaks work all the way through Thanksgiving! What could be better? 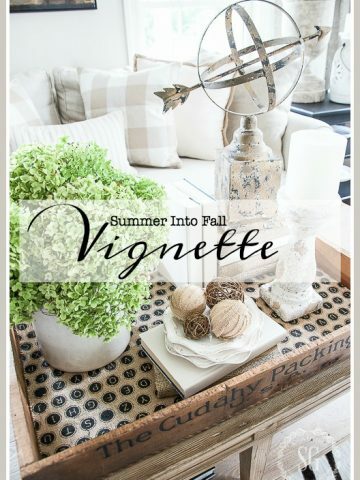 Vignettes are my favorite decor elements. They are personal and add so much of your style to your decor!!!! 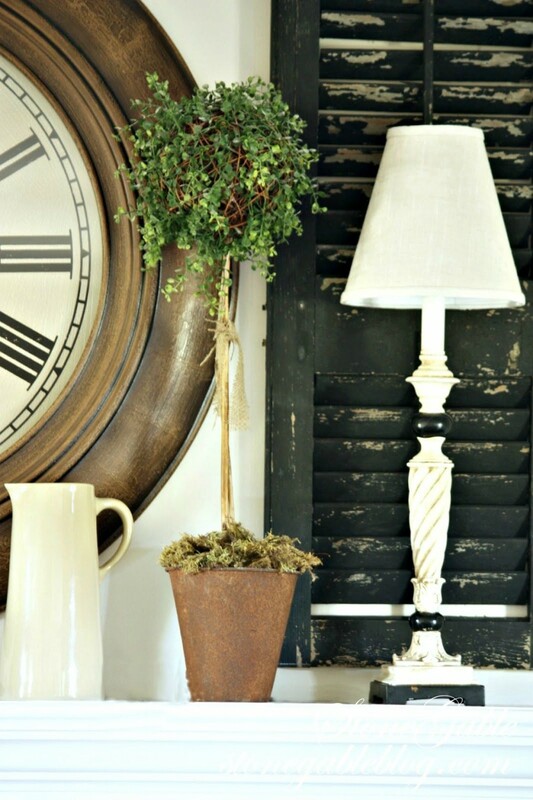 I’ll show you HOW TO STYLE A TRANSITIONAL VIGNETTE you will love! Here at StoneGable, playing with dishes is taken to a whole new level! I love to mix white dishes with dishes in fall colors. My very favorite early fall combo is white, black and citron green! LOVE IT. Your favorite fall colors may be different, but the point is… GET OUT YOUR DISHES AND PLAY! Stack them on your kitchen counters, island, tables and shelves. They are not just dishes… they are decor! Be creative…and as the season deepens into fall add more pumpkins and other fall elements! So easy and fun and just so pretty! 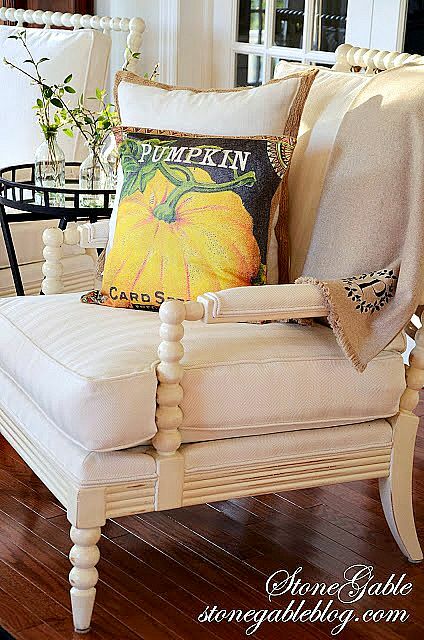 Let’s get out all those great fall inspired pillows, napkins, throws and any other textiles. Now is the time to wash and iron them or send them out to the cleaners so they are fresh and ready to go!!! You don’t have to use them just yet, but when you are ready they will be too! Also, how about looking for one or two new things. Look for early sales and things you just can’t live without. Better yet, let’s make something new!!!! Like this pillow from a placemat. Sew easy! 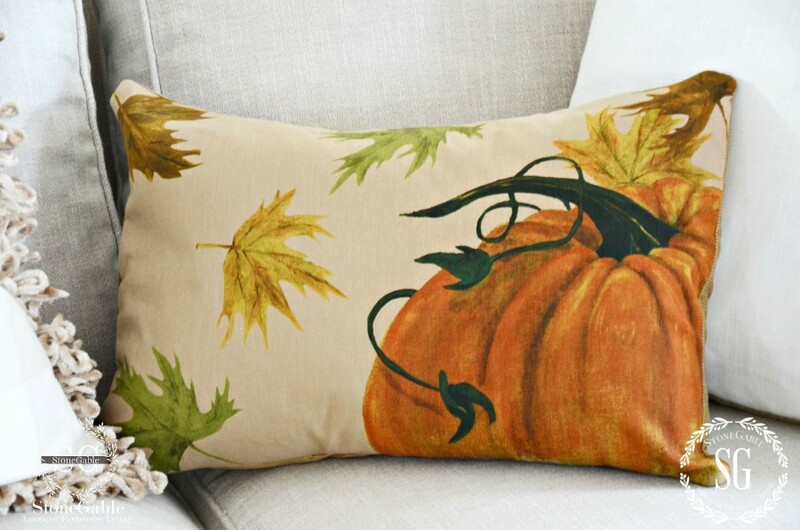 I have a fabulous source for fall pillows! Click HERE to see the PILLOW LOVE post with all the info. And if you want to try your hand at creating a PILLOW FROM A PLACEMAT, click HERE. Just like purging our old fall textiles that are no longer usable, we should go through all of our fall decorations and do the same. So when you are ready to use your fall decor you will know what you have, what you need and WHERE EVERYTHING IS! Just think how much easier it will be to have all your fall decorations organized! Start now and purge and organize a little bit each week until fall. It will be here before you know it! I keep all my WHITE KNOB TOP PUMPKINS in a clear plastic box that is labeled. They are easy to find and they stay all together! If you would like to see how easy this fall diy is click HERE. Guess what? I just made my early fall list!!!! There’s lots more, but I’ll add to the list as I think of things to do! It’s so important to have a list that is reasonable and doable and real! And it feels so good to be able to check off each fall task! Number 7 might not be for everyone, but I adore burlap and fall! They are a perfect pair. And I’m saying that burlap is no longer a trend, but a new classic! I have some fun burlap projects for this fall! I can’t wait to share them with you! One of my very favorite fall burlap projects were these BURLAP AND TOILE ACORNS. If you like them too… click HERE for the tutorial. These could be your “make something burlap”! After I make a wreath, the second thing I do is all about styling a mantel! Now, is a great time to take down all the summer mantel decor and opt for a great transitional mantel that with just a few changes can take your right through Thanksgiving! You know what works on your mantel so go for the look you love. You can add a couple pumpkins or a few branches of great autumn stained leaves in October! Here’s a little peek at Autumn in all it’s splendid beauty!!!! It’s coming to your neighborhood soon! Fall is just weeks away. I say enjoy the remains of summer… keep all ten toes in the sand and your glass filled with sweet tea… but take a little time to get ready for the beauty of the upcoming season! Get inspired and excited about transition times! Remember to pin this to your DECOR and FALL Pinterest boards. You can follow me and see all the great things I’m finding to pin every day HERE. I LOVE every idea for fall on this site! Can’t wait to get started! Loved the podcasts!! Just adore your inspiration too. New to your blog. Really enjoying your creativity. I loved the door knob pumpkins and acorns…but the diy info only opened to a blank page. I’m hoping this will be fixed because they look adorable. Looking forward to more great ideas. Hi Katie, Welcome to the StoneGable family! Love love love all of the creative ideas. You have truly inspired me to greater heights! Fall is also my favorite season! Love the pumpkins with the beautiful knobs-nowI know what to do with that drawerful of odd knobs! I am so ready for Fall! I live in S California and it doesn’t really feel like Fall until late October early November, but I always start decorating September 1 st, I have already started my planning because my daughter is moving home the second week in November! I need new pillow covers for the couch throw pillows and some new fall decorations, We are having a large crowd for Thanksgiving this year, but first I need to purge the garage! Thanks for the tips and list! Bring on Fall! Fall is my favorite season, and I’m especially looking forward to it this year. Last year we were in the midst of a kitchen remodel and my entire downstairs was a mess. I wasn’t able to do any decorating and went through serious “Fall withdrawal”. Yes, that’s a real malady, haha! Things weren’t completed until a week before Thanksgiving. Even the outside of the house was being re-sided and painted and I couldn’t decorate my porches either. Waaaaahh! I’m already scheming decor for this year, and I’m loving your ideas! Especially that placemat pillow. So cute! 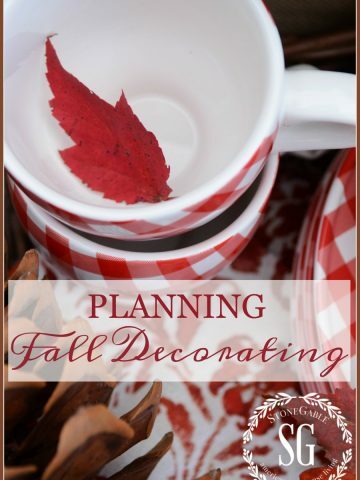 You will have a lot of fun decorating this fall, I bet! I love summer, but there is something to be said for that first crisp, cool morning that heralds the arrival of Fall. “Jacket” weather. The air just seems so fresh and alive. I like the transition of my home from one season to another. My front porch will be transformed and I love adding little touches here and there until it’s just right. I’m lucky enough to live in the Pocono’s where the splendor of all the trees turning color is amazing and I can watch it happen on a daily basis. I appreciate that people make special trips here just to see the fall foliage, and I don’t take for granted that I’m surrounded by it everyday. I’ll have to start planning my trip to Ken’s Nursery to get my white pumpkins! Thank you Yvonne for all your inspiration! OH My Gracious Goodness! 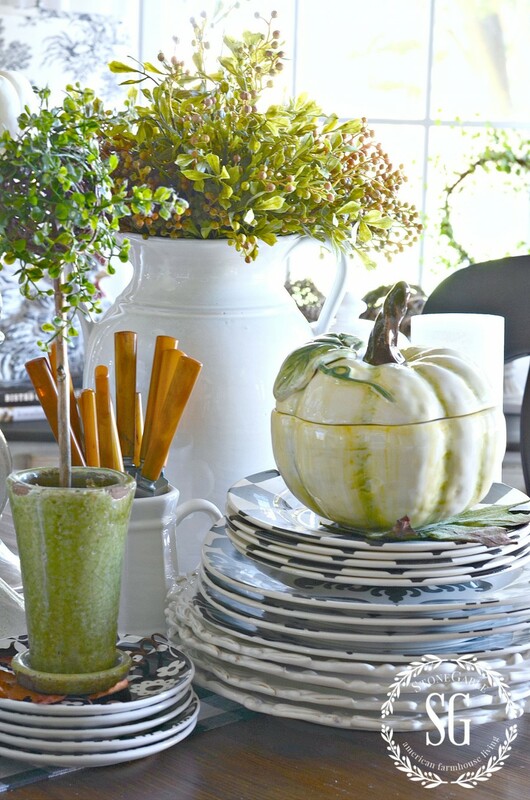 Love the vignette with the white/green pumpkin soup tureen. I have learned so much from your Blog and get great inspiration from your ideas. One of my great pleasures in life is setting a lovely tablescape or vignette when I have guests for dinner. I am an unashamedly dish-Aholic! Where did you get those gorgeous pumpkin soup tureens? What or who is the manufacturer stamp on back? It’s a must have! Always look forward to your next post, especially Sunday morning. The pumpkin soup tureens came from HomeGoods years ago. They have another home now, so I don’t have any more info. Sorry! How do you deworm acorns? Love you great ideas & although I am a summer gal I do love Fall as well. Put your acorns in a plastic bag, and put them in the freezer for a couple of days. Worms will fall right out of the acorns! I just moved from IL back to S CA. I am going to REALLY miss the autumn colors of the mid west. Fall is my favorite time of year. While its going to be 91 degrees here today, I am dreaming of the cool, crisp air and breath taking colors of autumn. I am going to start my fall decorating in a few weeks since it’s still summer here and will be for the next several weeks. Thanks for the inspiration, Yvonne. I really enjoy all the vignettes and ideas! Thanks for the inspiration!. I grew some awesome little pumpkins this year, they look exactly like your ceramic pumpkin pot, cream with yellow and green stripes…can’t wait to decorate with them. 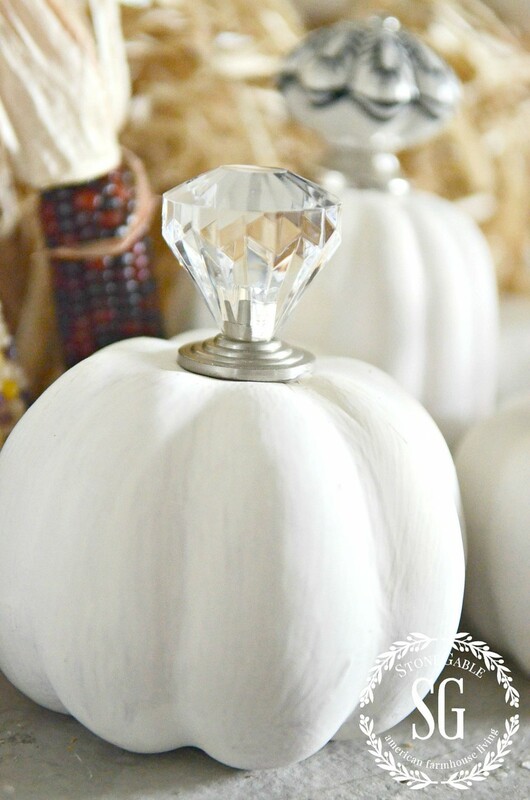 Love the pumpkins with the crystal knobs – so cute and elegant! I have an old wooden box and some patterned burlap so I’m going to cover the bottom of my box with it. I am using an apple theme for Sept for the apple picking season here in the Shenandoah Valley as well as an “apple for the teacher.” I’ll put some books in my box or under a cloche and have apples on top, pencils, etc. Love making themed vignettes! Love the fall. I do not do so well with extreme heat and August is a scorcher in Colorado. It would be a good idea to go away..anyway, today I stripped the main floor of all the summer decor and am ready to start easing into the autumn. This is a large house so it takes a long time to make the shift. Thanks for your suggestions and motivation. Hello Yvonne, As others have posted, I too had trouble opening some of the blog material. I’m sure you will figure it all out! I loved the new things though, and will be headed to the fabric store for material for pillows. Yvonne, the link to the tutorial of the burlap/pinecone acorns does not work for me, and I cannot find it on your website tutorials. Yes! And now is a good time because most stores have their fall supplies on sale right now! Tried to get the instructions for the white pumpkin door knobs but was unable to. Sorry. I’m a summer girl . DON’T Like Anything About fall/ winter. Love summer blues, and greens and ocean / coastal decor. Do not like red, burgundy ( yuk) or hunter green. Makes me sad. Love your inspirational ideas! Will you be fixing the problems with the links? I’d love to make the pumpkins and acorns!!! I too love fall! Here in Florida we won’t be seeing it for a while, but I will be ready for it with these ideas. And the tip on getting rid of some of the old and tired things…yes! Loved the white pumpkins with the pretty knobs. Move over Summer. . .Autumn’s beckoning!!! Summer 2015 has to be labeled one of the favorites of my adult life!!! We have had amazing, consistent rains and everything on the Prairie is still lush and green!!! However, Autumn is my favorite Season, too!!! Like you, I’ve done the purging, editing and labeling!!! Just this week, I re~arranged a glass front cabinet with Autumnal Dreaming on my mind!!! A few new purchases for some much needed replacement bittersweet has been made at $ale prices!!! Looking for those first textiles of the Season, soon!!! Thank you for always inspiring and subtle reminders to “dress” our homes for each Season of life, dear friend!!! I love fall, second only to Christmas – I could do Christmas all year, I do believe. Meanwhile thanks for the tips and plans to prepare for this fall, I pinned each of your ideas and copied your “to do” list. Can’t wait to get started. Oh my goodness, I love those little white pumpkins with the knobs! Those are so darling:) This is perfect timing for this post, Yvonne, because I have been browsing at different pics on Pinterest that I saved from you for inspiration:) I’m working hard over here with the front porch! I’ve been meaning to paint the front door during the summer, but never seemed to get to it…I even found me a really adorable vintage wool plaid throw blanket on etsy for $16:D Keep those ideas coming! Add this to the list: if you are growing pumpkins, carve messages in them while they are still in the garden. Then when they are picked, the message is on them. ( I saw this in France in a garden and loved it). What a cute idea, girls!!! LOVE IT! Me— well I love fall also but not ready to think about it nor transition into it. Where I live we don’t get fall until at least October. Shall file your great ideas until September. Hooray it’s still summer! Tuck these ideas away for when you are ready! 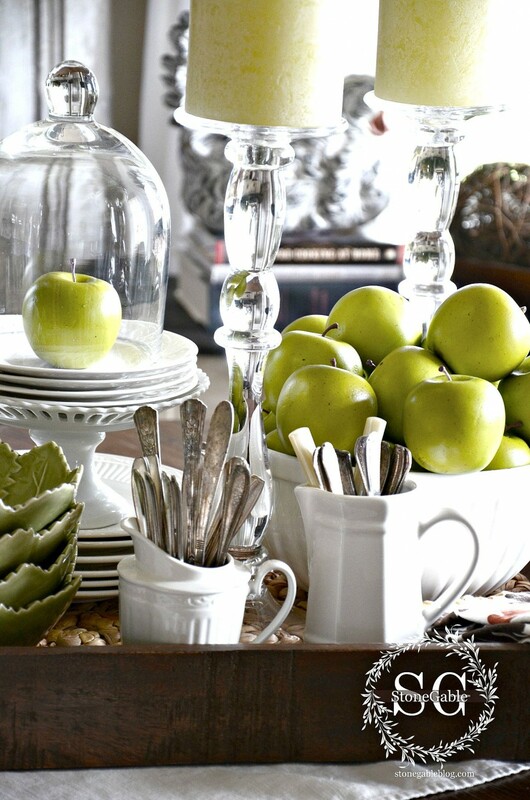 Love all of these great tips Yvonne I have everything to make a fall wreath with the green apples. 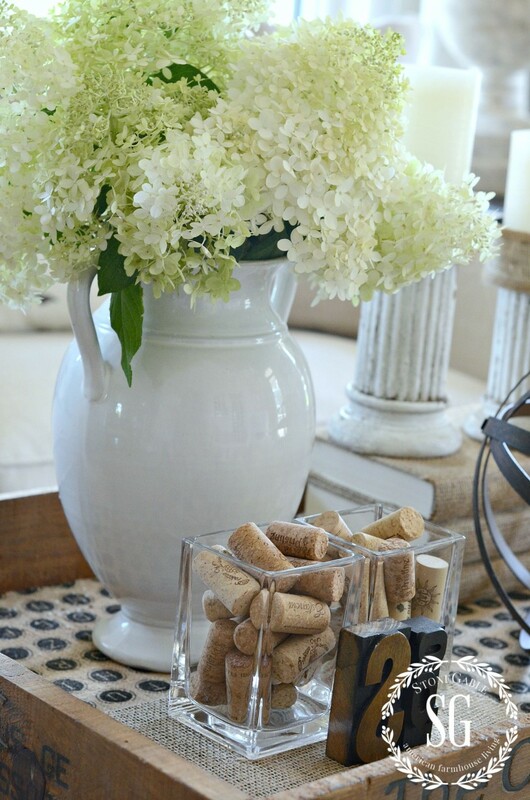 Got a great tip from you with Decore Steals…. Love my cotton stems that ordered. Perfect for this time of year for now they are in a white vase . Thanks ! Everything about Fall is my favorite , So I work hard @ making sure my home inside and outside reflects fall . Bit hard since I live in FL but nevertheless I push on Lol ! Love all your ideas thanks for sharing . LOVE your great attitude. YOU GO GIRL! I love all your posts…fall will be here before we know it! Love the white pumpkins but could not open the link!! Yvonne, this is exactly what I was looking for when I suggested a calendar on your FB page. This is going to really help me be focused. Thanks for this terrific post. FALL! FALL! FALL! Bring it on! I am ready to decorate! Love your suggestions! Where did the summer go!! I can’t quite get into fall yet,,but you’re right,,get rid of old things,,Thanks always for sharing,,you are so inspiring!! When I was growing up : Fall and Spring were my favorites. I still love the changing of the leaves, the crispness in the air. The colors in Spring are vibrant and beckoning. Fall means the renewal process is starting, then the Winter time means dormancy and a chance for rebirth of the flowers (not to mention the wrecked vehicles !LOL) then the Christmas season and the New Year for it all to start again. What I do miss is the Indian Summers as we dont seem to have those anymore. But Fall is a wonderful time of the year for me! I, too, am having trouble with some of the links. With temps in the 100’s here in Texas, I am so ready for Fall. 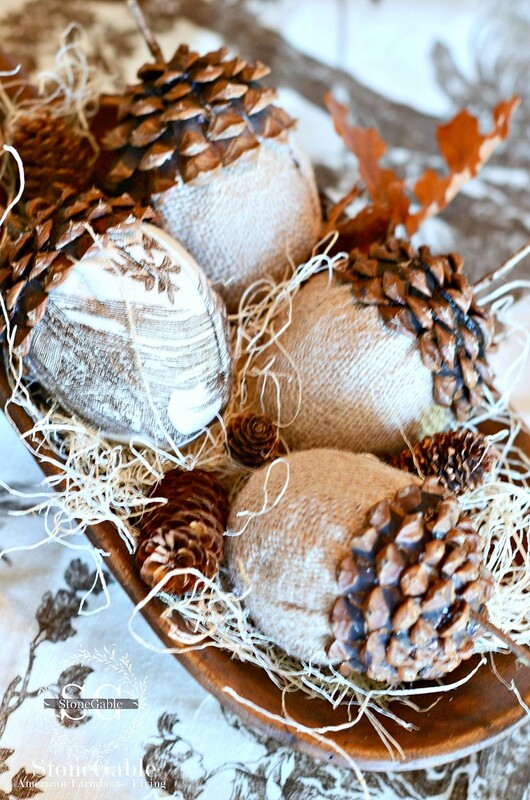 I love all your ideas, most especially the burlap pinecones – so adorable. I remember seeing a post about your home – I adore it. Where do you live? I’d love to find a place on a lake somewhere (maybe Tennessee or Kentucky or Georgia) where there are four seasons but the winters aren’t too brutal (I grew up in Northwest Indiana where they can truly be rough). Anyway, I love all your posts and ideas and thank you kindly for always sharing them with us. I tried to pin the pumking and burlap pins and those links seam to be having issues ? .. Looking forward to seeing the post in how too.??? I tried to get the tutorial for the burlap and toille acorns and can’t get it either. Yay, FALL! I love your tips, Yvonne, and was just pulling my Fall bins out the other day … now, I just need to go through them and decide on my color scheme for this year! I hope you’re enjoying a fun Summer … it’s been waaaaay too hot here, so Fall temps will be more than welcome! Thanks for the inspiration! Hi Yvonne, I love this one- planning ahead! I’m a planner. As much as I hate seeing school supplies in the store in July I do like to be prepared for the Holiday or next season ahead of time. This really inspires me to start planning for Fall. I Love! Love! Love! Summer but I do love Fall and all it’s rich, beautiful colors etc.! I will be taking many of these ideas to heart and hopefully applying them to my home for the Fall! Thank you! I live in western NewYork, I hang on to summer as long as possible! I do like the way you ease your way into it with your ideas. I look at dried and dead foliage for the better part of the year. I am not a big fan of a lot of orange, I love your ideas of the painted pumpkins and the pretty green apples! With the onset of autumn we get cooler weather and our flowers perk up from the stress of our hot, dry summers. The wild sumac starts showing their seed heads and we know it will soon be time to enjoy sitting outside in front of the fire pit in the late afternoon. I do so love the inspiration you are able to share with all of us from decorating to cooking to cleaning hints. Your hard work is very much appreciated. Oh, I love using the fire pit! Fall is my favourite season as well. Seeing this post suddenly made me very excited. I cannot wait. It will be my first Autumn in our new home too. I know!!! 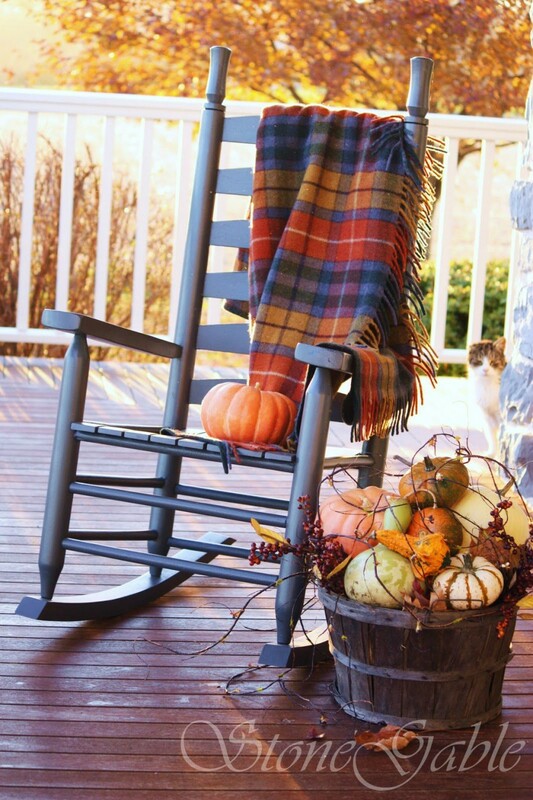 If you are a lover of fall, anything that looks like fall decor gives us a jolt of excitement! I can’t wait! I USED to love fall until I had to worry about snow. Yep! You can’t stop what comes after. But I love the feel of autumn — the colors, the temperature, the fruits and vegetables. There are still summer veggies and fruits lingering and then there are the new cooler weather treasures. I love you white pumpkin with the door knob and your wreaths are gorgeous — very inspirational. Thank you Yvonne!! Have a wonderful day.